It’s been a busy day for me, firstly I was delighted to go on Newstalk this morning to chat to the lovely Pat Kenny about healthy school lunches. For those of you that missed it, I had a number of suggestions that I believe work very well and with my own two children I have tried and tested many methods to get them to include some goodness into those lunchboxes. So with that mind I will leave you with the link to the recipes I covered today with Pat that can be found on Newstalk along with the video that I appeared in that aired to many millions of Chinese earlier this week that was put together to highlight Ireland and all it’s fantastic tourist attractions and beauty spots, food and culture. I was proud and happy to showcase Irish food and chat to the fabulous film crew that visited us here at Ballyknocken Cookery School. 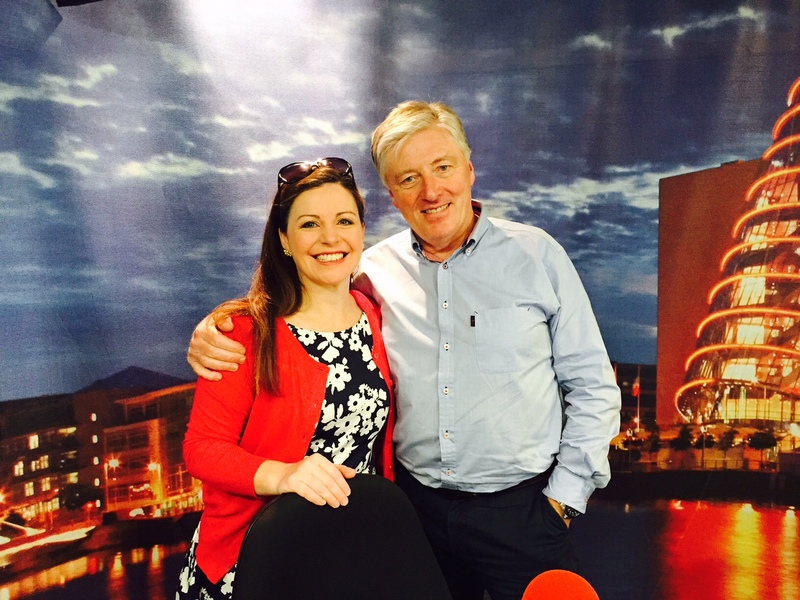 So have a lovely weekend and I will leave you with a photo of myself and the lovely Pat Kenny, thanks for having me on the show Pat. Get the most out of your Weber with a trip to Ballyknocken Cookery School in Co Wicklow. On Saturday 1st August Ballyknocken Cookery School will host a Weber Grill Academy Barbecue Course. Starting at 14.30 and running till 18.30 it’s the perfect way to start the Bank Holiday weekend. You will start with a meet and greet, where the Weber trained chefs will run through all the exciting ingredients and sumptuous food you will be preparing. After each stage of hands on food prep, you will go outside and get to grips with all the fun of cooking on a barbecue. As each course is ready, while the next one is cooking you get chance to sit down with your fellow barbecuers with glass of wine and enjoy the fruits, or foods, of your labour. Suitable for all levels of experience, the Weber Essential course includes mastering Weber’s renowned “lid-on” barbecue techniques for grilling, roasting, smoking and baking; using a combination of charcoal and gas barbecues. 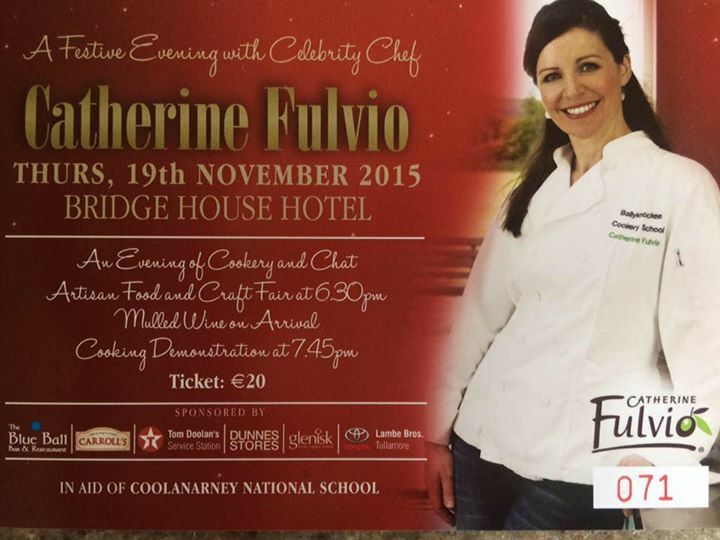 Includes a 4-course meal and a recipe booklet to take home with you. This course is suitable for all levels, this is a fun hands-on barbecue course run by an expert team of Weber trained chefs. You will cover everything from lighting your barbecue to temperature control as well as exploring various barbecue cooking methods including mastering Webers renowned ‘lid-on’ barbecue techniques for grilling, roasting, smoking and baking, using a combination of charcoal and gas barbecues. 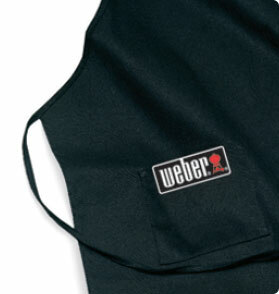 The course includes a 4-course meal, complimentary Weber apron and recipe card to take home with you. *Please note your booking is handled by Weber but please do not hesitate to contact us if you have any queries. The funniest social media post this week was my pizza with chips topping photo, I came across this popular pizza in Sicily and just had to see what the reaction to it would be back home. Somehow I don’t think I will be putting it on the cookery class plan anytime soon but it certainly got you all talking. I have also started my latest competition for free place on my 30 mins mains class this month so go to my Facebook page to find out how you can win that fab prize ……. So on a healthier and wiser note, this week I would like to share a delicious Friday foodie recipe with you for this evening. It really has been four seasons in one day here at Ballyknocken and after a busy day in my cookery school I really do plan to get cozy soon and start preparing this gorgeous classic that is so full of goodness and flavour. 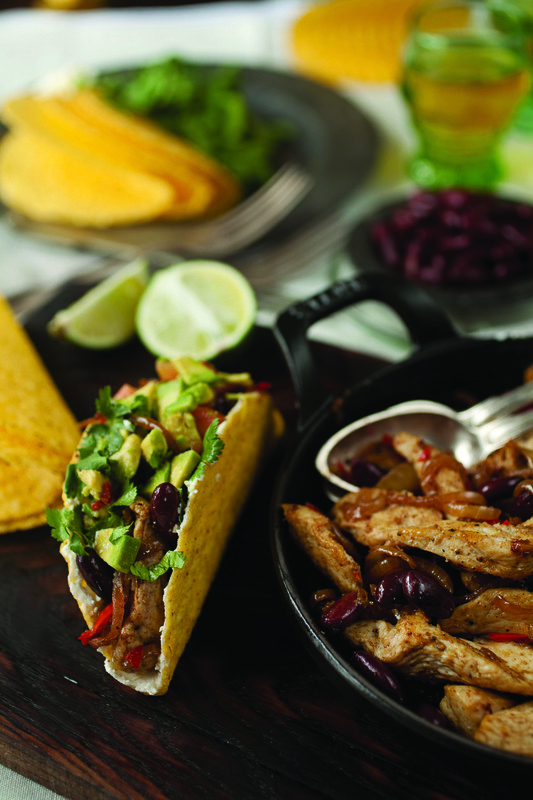 I really feel like a bit of chilli this evening and these spicy tacos have just that perfect kick that is not too overpowering and all can enjoy…even the kids !!!!! Here they are and don’t they look so tasty…………………….. The chicken, bean and onion mix can be made ahead of time. Wrap them in funky napkins, as they do tend to be messy, and serve in a basket –less tidying up for you to do! 1 To make the salsa, combine all the ingredients in a bowl and mix together. 2 Preheat the oven to 180°C/fan 160°C/gas 4. 3 Heat the oil in a saucepan over a medium heat. Sauté the chicken slices with the cumin for 3 minutes, until cooked through and lightly browned. Using a slotted spoon, remove the chicken from the pan. Add the onion to the pan and sauté for about 5 minutes. Add the chilli and garlic and cook for a further 2 minutes. Add the kidney beans and return the chicken to the pan and cook for 4–5 minutes, until fully heated through. 4 Place the tacos on a baking tray and heat in the oven for 2 minutes, until warm. Spoon the chicken filling into the tacos and return to the oven for about 2 minutes. 5 Sprinkle with parsley, spoon over a little cream cheese and serve with the lime and avocado salsa. Hi everyone and I hope you all had a fantastic week, as you know I enjoy my role as brand ambassador working alongside some excellent Irish companies. I really believe in the products I endorse and working with Whirlpool Ireland is just a wonderful experience for me. I would have no hesitation in recommending any of the Whirlpool appliances I have had the fortune to work with both in my cookery school and off site at one of my cookery demonstrations around the country. Courgettes are a perfect summer veg and are coming along in the garden and in abundance in the local fruit and veg shop Please enjoy this delicious and healthy summer recipe for one of those lazy family summer evenings. 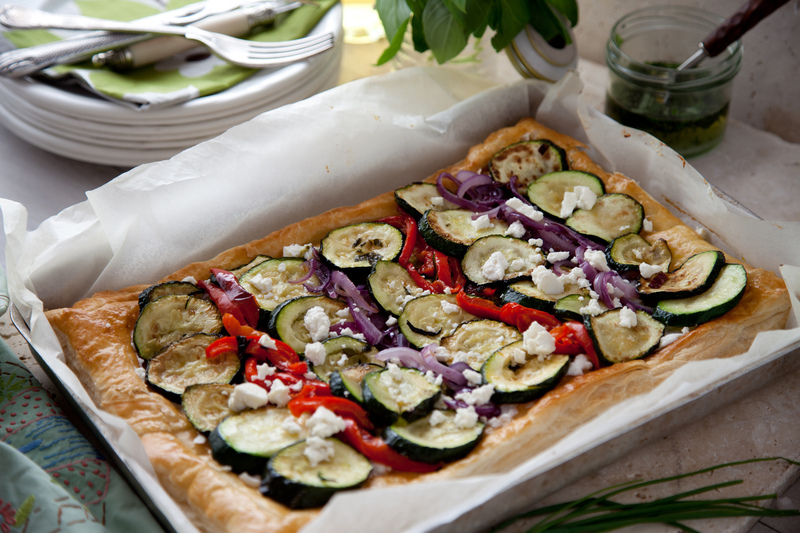 A mouth watering Courgette, Feta and Chive Tart. At this time of the year Courgettes are coming along in the veg garden here at Ballyknocken and what better way to use them than with this delicious tart for a light lunch or starter. Preheat the oven to 180°C/fan 160°C/fan 4. Place the onions, courgettes and red pepper slices into a roasted pan and drizzle with oil, sprinkle over the paprika as well as the chives. Roast for about 15 minutes until just tender. Season with salt and freshly ground black pepper and set aside. Increase the temperature of the oven to 190°C/fan 170°C/fan 3. Place the pastry on a piece of baking parchment onto a baking tray. Measure a 1½cm edge around the pastry, using a sharp knife cut out the edge, carefully not to slice all the way through. Using a fork, prick the inner rectangle of pastry and brush with egg wash. Bake for 20 minutes until golden. Remove from the oven and press the inner pastry rectangle down slightly. Combine the basil pesto and ricotta and spread over the pastry leave the edge. Arrange the roasted vegetables on top and season with salt and freshly ground black pepper. Drizzle over a little rapeseed oil. Sprinkle over the feta and bake for about 7 to 8 minutes until the feta is slightly golden. Arrange the chive lengths on top and serve immediately. Tip: out of courgette season, any vegetables can be used like roasted sweet potatoes, cherry tomatoes and artichokes and sprinkle over chopped rosemary. 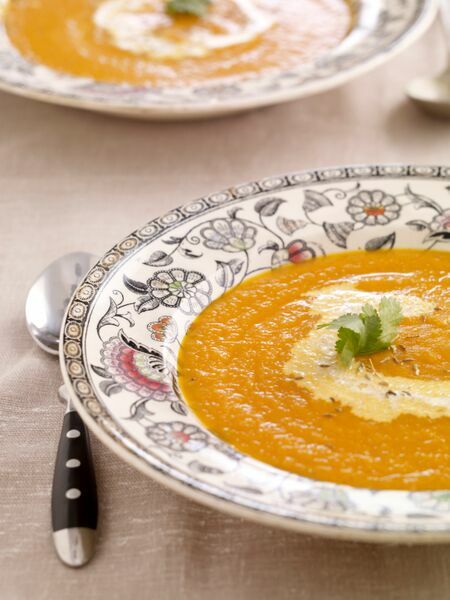 Hi everyone, well another hectic week at Ballyknocken Cookery School but I am going to take some time out here to talk Father’s Day and share a fabulous recipe for this extra special weekend. I don’t know about you but what better than to show our Dad’s we are thinking of them than preparing a tasty drink packed full of goodness and flavor especially designed to boost energy and well-being. 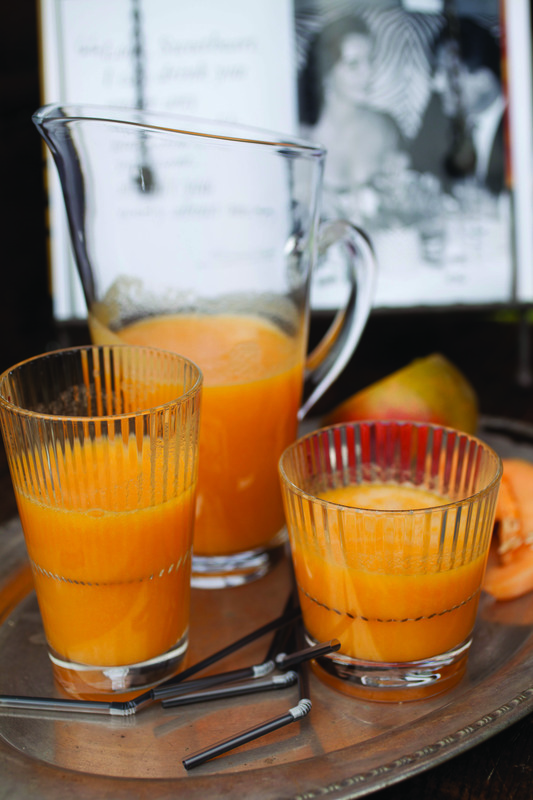 Melon, Mango and Lemongrass Smoothie is just sunshine in a glass. You could try it without the melon and add strawberries instead, but I don’t think I would change it at all. It’s lovely after a long hike with the family into the countryside, as the lemongrass is very energising. and add the honey to taste. Pour into tall glasses with ice.